Photos by Natasha Simpson, Staff Writer. 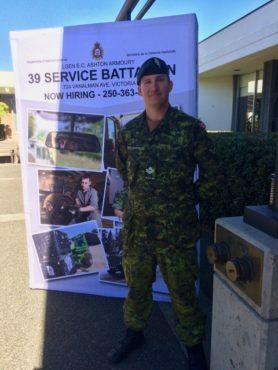 Master Corporals Owen Seginson and Brendan Morton of 39 Service Battalion arrived outside the Student Union Building on Sept. 28 with a Medium Support Vehicle System (MSVS) and their recruitment faces on. Their goal: to inform students about the opportunities available to them in the Canadian Army Reserve Force. According to Master Cpl. Morton, a weapons technician who has been in the reserves for nearly a decade, joining up is a great option for students. 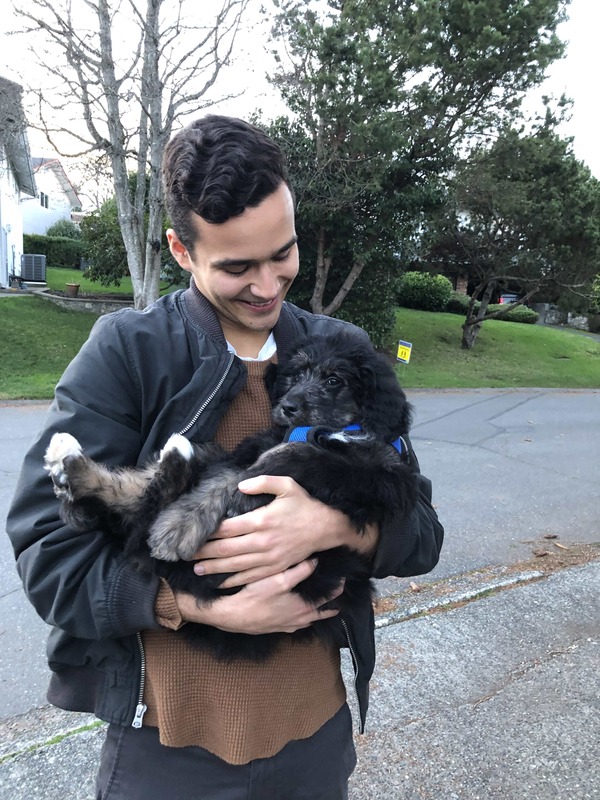 Benefits, he says, include “part-time employment, an $8 000 bursary over four years, 90 per cent dental, and full-time summer employment.” Pension plans and healthcare benefits are available, too. 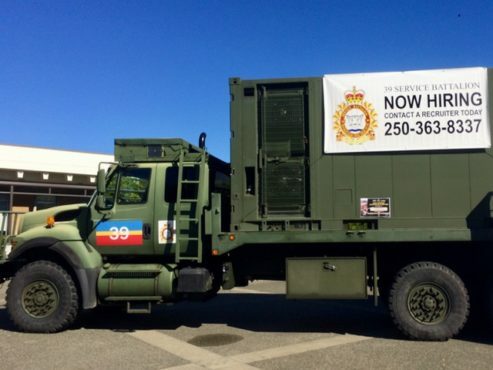 Reservists gain valuable experience for future civilian jobs, and the army pays for trades training and certifications — such as the Class 3 driver’s licence needed to drive the MSVS parked next to the recruitment poster. Most Reservists train one evening per week and one weekend per month at locations close to home. 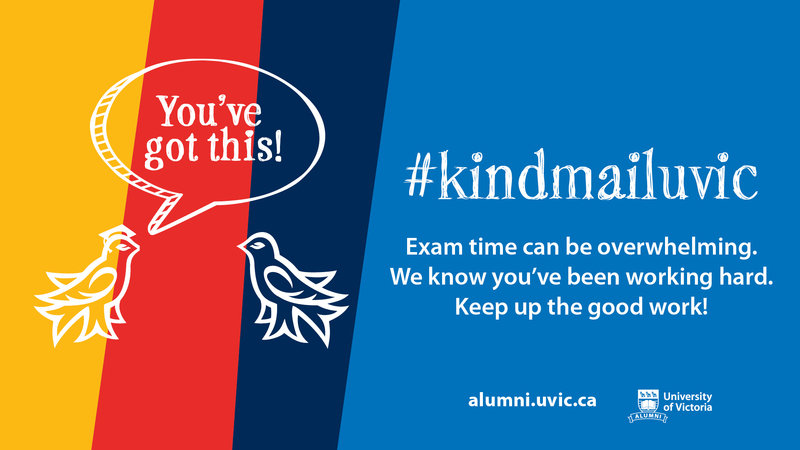 Many are students or have other careers. They serve in domestic operations dealing with natural disasters, or any other situation that requires army assistance. International deployment is on a voluntary basis. Positions at the Lieutenant-General EC Ashton Armoury include mobile support equipment operators, supply technicians, cooks, mechanics, weapons technicians, human resources administrators, and financial services administrators. For those who want to wield the pointy end, Victoria’s other Army Reserve regiments are the Canadian Scottish (Princess Mary’s), and the 5th (British Columbia) Field Artillery. Both units share the well-known Bay Street Armoury as their headquarters. The Canadian Scottish, an infantry battalion, dates back to the early 1900s, and the 5th Field Artillery has existed since before Confederation as the oldest army regiment west of the Great Lakes. Both regiments served in the world wars, and soldiers from both units have deployed with Canada’s Regular Force in UN and NATO operations worldwide. Like the rest of the Canadian Armed Forces, the Reserve Force suffers from chronic underfunding, outdated equipment, and personnel shortages. Since 2015, part of the Canadian government’s plan to rehabilitate the military has been to expand and strengthen the Army Reserve Force. To this end, enrollment time has been reduced from 60 days to 30, and full-time summer employment is guaranteed for at least the first four years of service. The Forces are in a financial hole dug by successive funding cuts by various governments, and new people are needed to help build a way out. 39 Service Battalion plans to make monthly recruitment trips to campus, although there is no set date for the next visit. For students interested in the Reserve Force, 39 Service Battalion is hosting a Soldier for a Day event at the Ashton Armoury at 724 Vanalman Ave on Nov. 17. Participants will learn about the training process and aspects of being a soldier in the Canadian Armed Forces. They will have the opportunity to see some of the vehicles and equipment used, and may experience part of the military fitness test.